Our first line of diagnostics is our experience with you and your pet in the exam room. 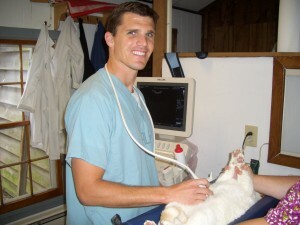 Our doctors can gather a great deal of information from talking with you and examining your pet. While our doctors can make many diagnoses with just their hands, eyes, and ears, they occasionally need a closer look at your pet’s insides. At Red Lion, we use digital radiography and ultrasound to thoroughly evaluate your pet. Radiology allows us to take x-rays to better image the bones and organs of your pet. Some of our doctors have advanced training in ultrasound and are able to use our state of the art digital ultrasound machine to get an even more detailed view of your pet’s organs. Your pet’s favorite aspect of ultrasound and radiology is that it is non-painful and most animals don’t even require sedation.